Product information "Zipato RFID Keypad + RFID Tag"
The Zipato RFID Keypad combines RFID and Z-Wave technology and offers various possible applications due to numeric keypad and RFID tags / cards as well. Use it for example to “tell” your smart home that you’re leaving home and appropriate automation scenes should be triggered. In this case push the “Away” button and hold the RFID tag in front of the keypad. Thus, you can switch off all lights and stand-by devices and down-regulate the heating in your home by automatic scene. Of course, you can arm your security system, too. The door was closed accidently behind you and you don’t have the key with you? As of now that is no longer a problem for you. 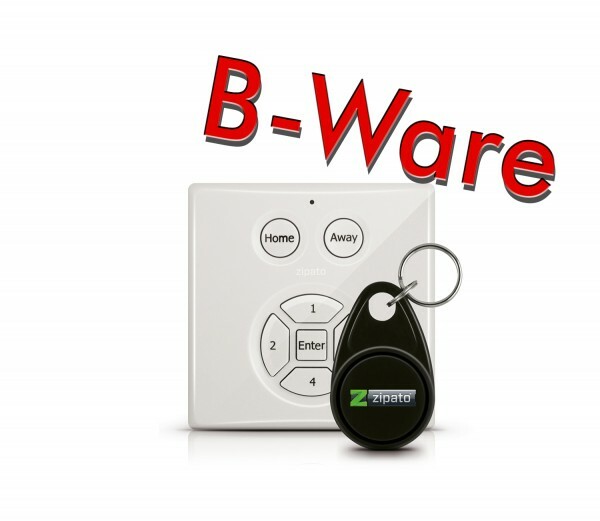 Thanks to PIN code combined with a Z-Wave door lock you can open the door again. The RFID chips / cards will login to your smart home center with theirs unique ID number. Thus, RFID chips or cards are the ideal substitute for a key – visitors, contractors or craftspeople gain admission to your home for limited period. Related links to "Zipato RFID Keypad + RFID Tag"